Harvesting raspberries at Applethorpe, southern Queensland. 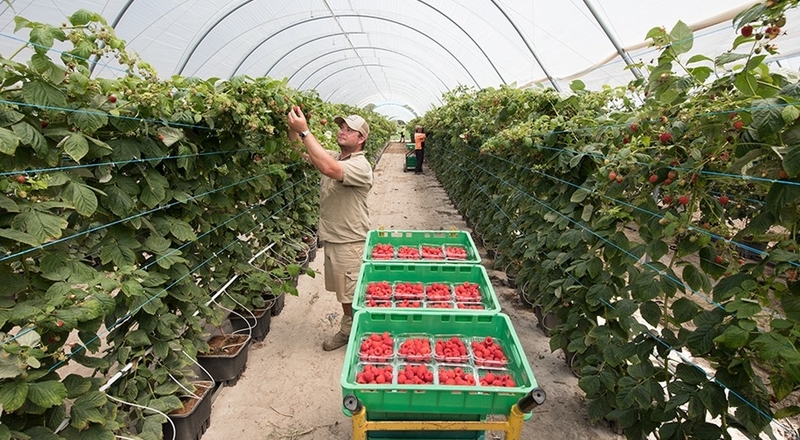 Piñata Farms' joint venture company, BerryWorld Australia, is harvesting summer raspberries at Applethorpe, southern Queensland, as operations expand in Queensland and Tasmania. Managing director Gavin Scurr said the specialty raspberry crop, the second since launching in early 2018, was performing extremely well with genetics resulting in superior fruit with an outstanding shelf life. BerryWorld Australia is on track to produce specialty raspberries year 'round by 2020. A farm is under development at Orielton, Tasmania, and the first stage of construction at Wamuran, south-east Queensland, including 32 polytunnels, is underway. At Wamuran, Piñata currently produces pineapples, strawberries and specialty BerryWorld strawberries. Technical manager Lee Peterson said the Tasmanian operation was being connected to the South-East Irrigation Scheme while a commercial quantity of plants was being propagated for the Queensland and Tasmanian crops. He said while the new farms were being established, berry operations at Stanthorpe were being refined. "In strawberries, we've recently changed from a triple-tiered bench system to a double-tiered system which gives us more control over consistent ripening," Dr Peterson said. "We've also started packing strawberries using customised trolleys. Pickers require more training because we're bringing QA into the field, but this minimises handling and bruising." Reflecting shadecloth to reduce the in-tunnel temperature by up to eight degrees has been installed and a new raspberry trellis design for better canopy management has been implemented. In the packhouse, metal detectors, CCTV cameras and tamper-proof, heat-sealed strawberry punnets continue to boost customer and consumer confidence in the premium offering. Plans are also underway to introduce heat-sealed punnets for Piñata strawberries in time for next winter.